Get ready for some fire! Even people who don’t have kids know that there’s a reason why they call it “The Terrible Two’s” and the “Me Me Me Threes” - those little buddies are coming into their own sense of self, and if anyone tries to stop them from getting what they want…watch out! It’s just all part of the growing-up process, and we gotta admit - sometimes, it can actually be pretty entertaining to watch them stomp and roar around over the littlest things. At least they’ve got a personality, right?! Luckily - or unluckily! - those tantrums will be on a whole new level with this Toddler Dinky Dragon Costume! There will be fire and smoke and maybe even a little flying. But I think you can handle it. Just keep all flammable items away and ... well, run. 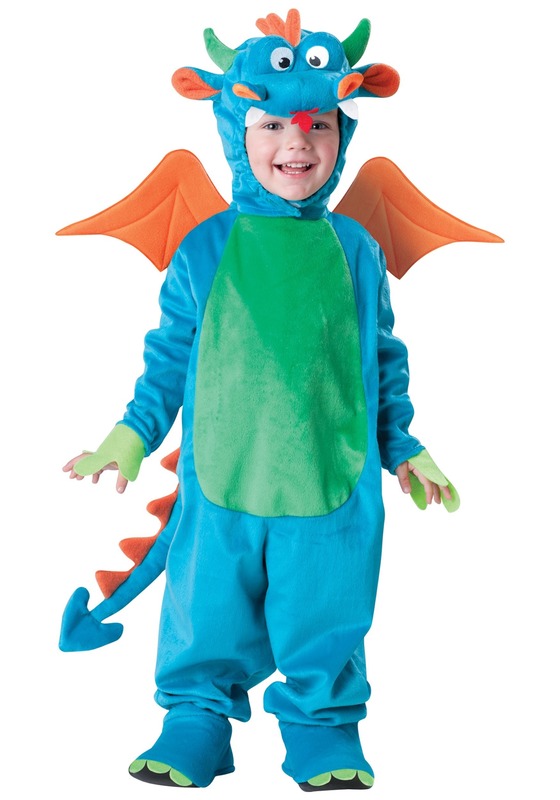 Made of 100% polyester, this Toddler Dinky Dragon Costume zips and Velcros in the back and has elastic around the wrists and ankles for easy slip-on and take-off. The front of the jumpsuit is light blue with a green stomach, and sports a blue tail with orange spikes that’s attached to the back of the jumpsuit. It also has soft orange wings that snap onto the back, and a hood - sporting a dragon’s nose, eyes, ears, green horns, and orange spikes! - that fastens with a velcro clasp at the chin. It even comes with shoe covers that fasten with Velcro! This costume is so cute and fun, the only thing you’ll have to do to make your toddler’s next costume excursion a success is just keep all flammable items away from them and ... well, run!